PHOENIX, AZ--(Marketwired - Jun 7, 2013) - Financial professionals from all over metro Phoenix took time away from the office recently to help out thousands of hungry Valley youth. More than 150 employees from BMO Harris Bank, BMO Private Bank and Stoker Ostler, all a part of BMO Financial Group, formed assembly lines in locations throughout the Valley to put together cinch sacks filled with food to help keep children in need fed over the weekend. Working with Valley of the Sun United Way, BMO employees prepared nearly 2,500 snack packs, with each cinch sack containing 10 healthy snacks. The bags will be delivered to United Way partner agencies throughout metro Phoenix who have expressed a need for them. Additionally, 500 weekend meal packs, containing enough food for meals and snacks for an entire weekend, were prepared and given to United Food Bank for distribution in the Southeast Valley. "We are committed to supporting our community through the giving of our employees' time and talents as well as our corporate financial resources," said BMO Harris Bank Arizona President Steve Johnson. "Each year our employees look forward to the day we set aside to help others." 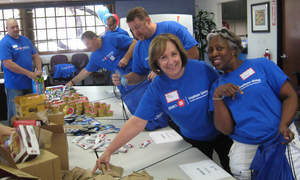 Launched in 2001, BMO Volunteer Day has grown to include approximately 5,600 employees participating in more than 470 projects in communities across the U.S. and Canada, including activities to benefit children and youth organizations, elder care, food banks, community housing, health care facilities, family resource centers, parks and recreational facilities, military personnel, relief organizations and homeless shelters. "Volunteer Day is just another demonstration of our corporate philanthropy and the generous work our employees perform year-round in our communities," added Johnson. For more information on how you can help feed a hungry child this summer, contact Valley of the Sun United Way at: http://www.vsuw.org/, or United Food Bank at: http://unitedfoodbank.org/. For additional information about how BMO Harris Bank supports the community, click: HERE. BMO Financial Group Employees assemble meal packs for United Food Bank to feed area children over the weekend.